We wait all year for our favorite delicacy to come into season only to watch it spring, mature and wither before our very eyes. Living in the high speed world of today we’re fortunate just to get a taste or two while it’s still in its prime. So unless one is a fulltime “hunter and gatherer”… initiating methods of food preservation is a must if we are to capture the seasonally fresh flavor of natures produce. The following steps will show you how to blanch and vacuum freeze your favorite foraged veggies. 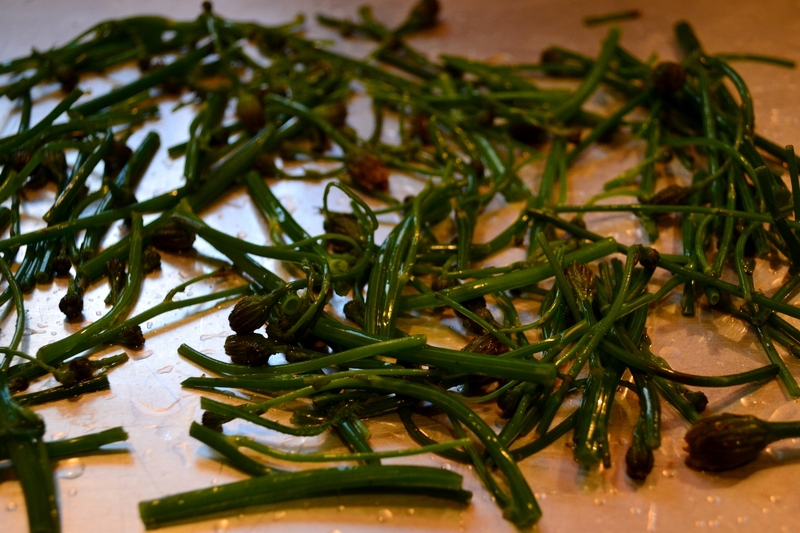 Rinse with water and chop your favorite veggie into sections between 2 – 3 inches long. A new found love of mine is the delicious flower stalk of Cat’s Ear. Unfortunately these are only tender and thus in their prime for the first few weeks of its initial growth. With that said it’s the perfect candidate to be preserved. 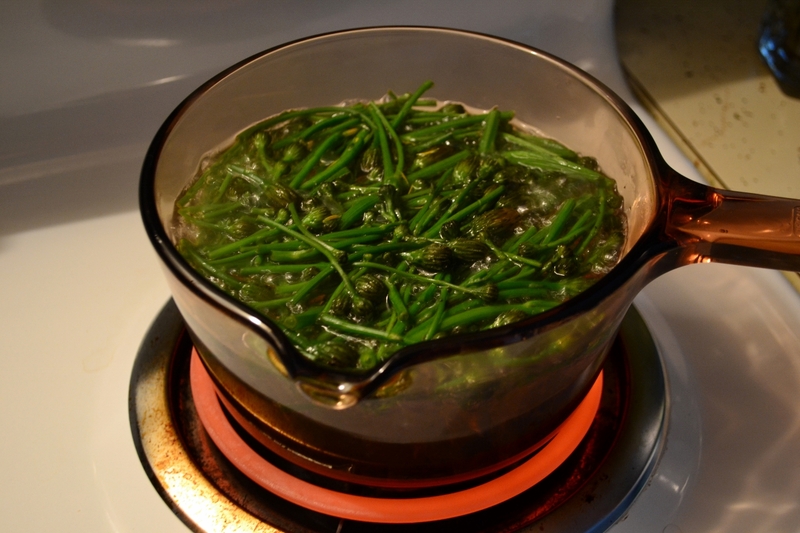 With water in a pot on a rolling boil, add the forage and blanch for exactly 1 minute ready to be quickly strained. 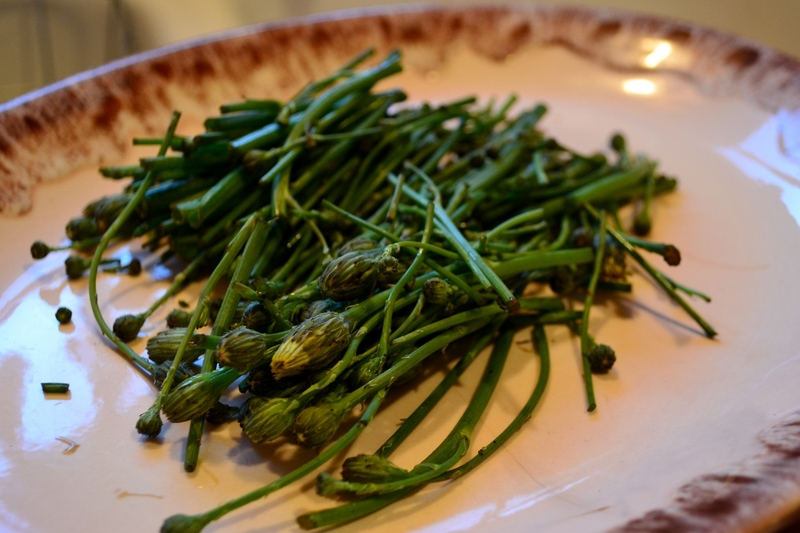 Add the forage to boiling water and blanch it for 1 minute exactly, be ready to strain it quickly. 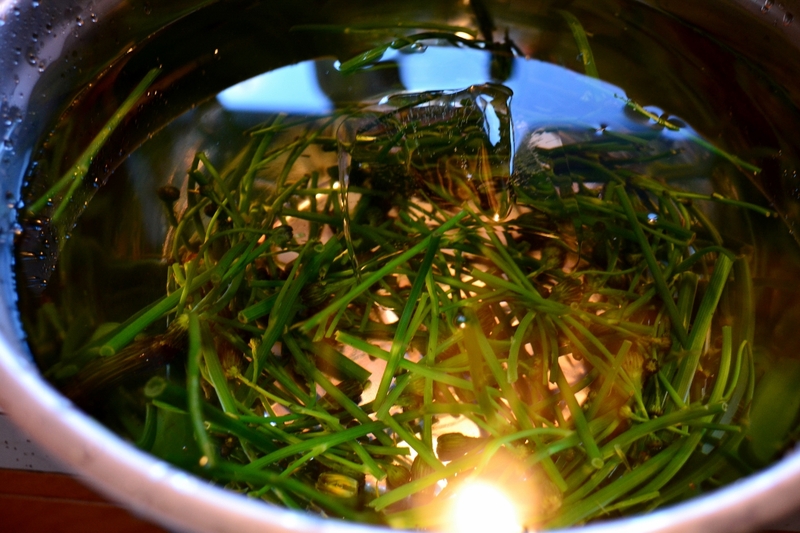 When one minute is up, strain the forage quickly and submerse in an ice water bath. 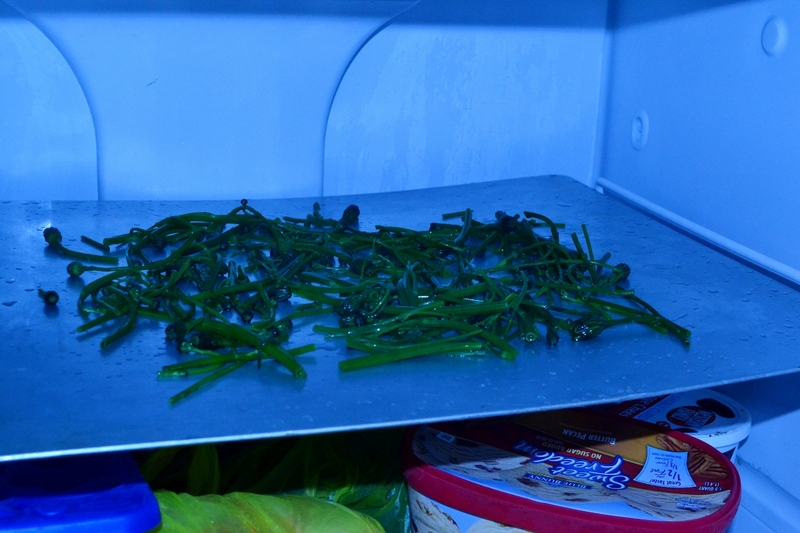 The forage is quickly strained and submersed in ice water to reverse the cooking process. 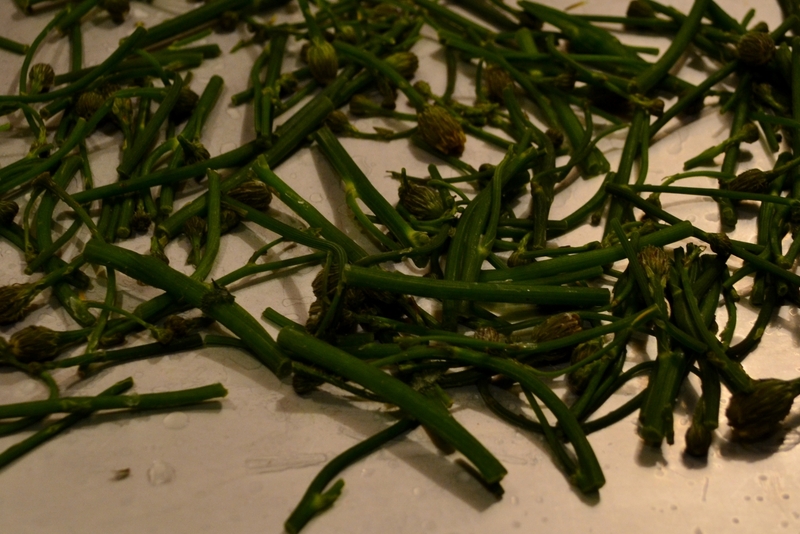 With the forage chilled, strain again and place spread out on a cookie sheet ready to be placed in the freezer. Put in freezer and allow to freeze completely. Spreading the forage out will allow it to freeze quickly also preventing it from freezing as a solid block. Allow to flash freeze for at least one hour. With your forage completely frozen use a spatula to scrap off any difficult pieces. 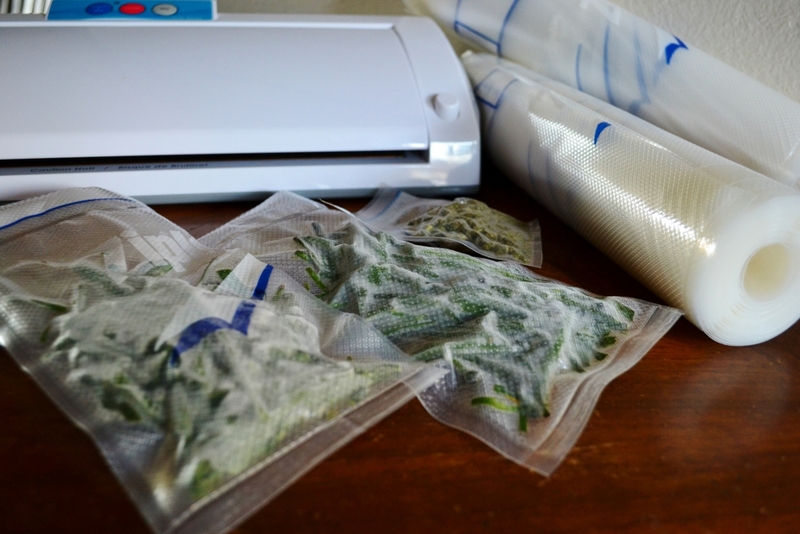 Quickly place your frozen forage before a complete thaw in a vacuum seal bag. Using a vacuum seal machine, vacuum, seal and place back in freezer. Forage right out of the freezer completely frozen and ready to be bagged. Once vacuumed and sealed, this forage will remain fresh for many months! In only 5 steps, you too can enjoy the fresh flavor of your favorite season for many months to come. – Precut bags for desired portion sizes to be used, this ensures longer freshness for any unused forage. – Mark both food type and date on each bag using a felt pen before bag is filled.